Together with our partners at BirdLife South Africa, the The Botanical Society of South Africa, SABMillerand WWF South Africa’s Better Barley Better Beer Project, the Overberg Crane Group and Sijnn Wines, we have produced a very impressive Renosterveld booklet for guiding managers and farmers on veld management and identification of some key species. Lowland Renosterveld is the relatively fertile, clay-based veld type that occurs in the low-lying areas of the Western Cape. Renosterveld is part of the Fynbos Biome, although it is very distinct from Fynbos – the main difference being that it lacks the three distinctly fynbos elements: the proteas, erica (heather) and restios (reeds). 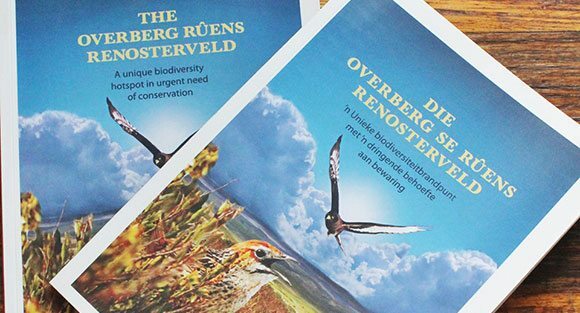 > Download the Renosterveld Information brochure.